The sustainable concrete tile roofing material resists the hail, fire, snow, and wind that is experienced in mountainous terrain surrounding Denver. 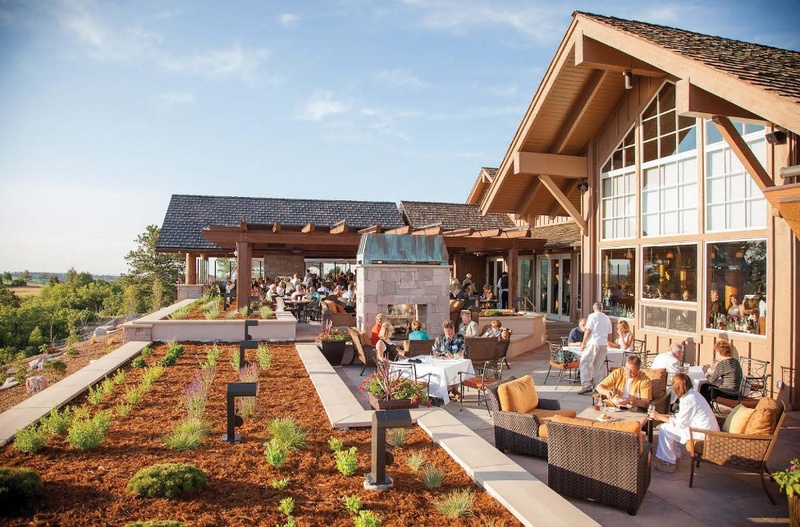 Extensive renovation of the golf course and clubhouse at Castle Pines included replacing the wood-shake roofing with weather-resistant concrete tile. As seen in the October 2017 issue of Commercial Architecture – A person can play The Country Club at Castle Pines and feel he’s had a great time no matter what his score, simply because of the views.” That’s a direct quote from golf legend Jack Nicklaus on playing the course. He should know. Just 30 minutes south of downtown Denver, Castle Pines is a golfer’s paradise boasting a signature course designed by Nicklaus himself, along with a luxury clubhouse. The facilities are set within the prestigious Castle Pines community amidst rugged, picturesque mountain terrain. The Clubhouse at Castle Pines originally opened to members in 1993. Having recently undergone a robust $5-million renovation, the facility delivers a classic, rustic, yet upscale atmosphere. Luxe wood adorns the ceilings and mountain-inspired furnishings and natural light fills the space. Commanding windows naturally draw one’s gaze to unparalleled panoramic views of the surrounding mountain range and signature course. In addition to the interior overhaul, the addition of a gorgeous 6,000-sq.-ft. outdoor terrace now allows guests to dine and socialize comfortably in the enviable setting. When the extensive renovation neared its completion, it was decided that a new roof was also needed. The existing roof, made of wood shakes, had not only aged but was highly susceptible to fire and hail—two major concerns in Colorado’s environment. The team, which included personnel from Castle Pines and Eco Roof and Solar, reviewed numerous roofing systems, focusing primarily on finding a solution that could help withstand all of the elements. The material also needed to complement and enhance the clubhouse aesthetics, while celebrating the architectural style of the surrounding community and the luxury homes within it. Along with the clubhouse, the Jack Nicklaus-designed Castle Pines golf course was also renovated. After looking at numerous options, the team chose Irvine, CA-based Boral Roofing’s Class 4 hail-rated concrete tile. The benefits of concrete roof tile were an obvious fit for the project. The tile offers superb durability and a lifespan exceeding 60 years. Considered a low-maintenance material, the tile is also easy to repair and, when called for, a small portion of the roof may be easily replaced if the damage is localized. Concrete tile is also considered a resilient building material in that it can help withstand storms, hail, fire, snow, and wind. The roof is often the first point of contact for these conditions, acting as the structure’s first defense. Concrete tile ranks especially high in its protective abilities. The tile, now on Castle Pines’ roof, has undergone impact resistance testing in accordance with the FM 4473 standard, withstanding 2-in.-dia. ice balls shot from a cannon at a 5-ft. distance at speeds approaching 70 mph. Hail-rated tile is certified through the Roof Covering Impact Certification Program, which is sponsored by Architectural Testing Inc., Franklin, WI, an independent laboratory accredited by multiple national agencies. Aside from hail and storm resistance, energy efficiency is often a key consideration in roof selection. While it wasn’t a primary priority for the clubhouse re-roof, the team was pleased to learn that Boral’s concrete tile significantly reduces energy demands inside the structure. “This will help Castle Pines reduce its energy bills for the life of the structure,” adds Moore. Concrete roof tile is also truly sustainable roofing material. Manufactured using locally sourced, naturally occurring, and abundant geologic material, Boral’s tile incorporates zero chemical preservatives and is 100% recyclable at the end of its life on the roof. From an aesthetic viewpoint, the color and profile of the tile was also key. Boral’s Western Trail in Saxony Slate Impact Tile offers a hue and look that complements the design of the structure and the natural surroundings, creating a seamless bridge between the two. The tile selection also aligns with the tile roofs used on homes in the community. “With an enhancement to both the aesthetics and the safety of the clubhouse, as well as to the golf course, Castle Pines will hold on to its reputation as an incredible, world-class destination for enthusiasts for many years to come,” added Moore.